Premium damask, high-definition woven labels. We create high quality labels that will simply make your logo or design shine. Your brand label is an indispensable part of your brand identity. Often undervalued, labels tend to get ordered at the last minute. It's nice to know we can guarantee both quality and fast deliver time! Please note! Make sure the characters in your design have a width and heigth of at least 2 mm for the best result. Your brand label, woven label, all words for a label unique to your brand. Only brand hallmarks like this can give value to your product. If EE creates your woven brand, you can rest assured that it will look perfect. 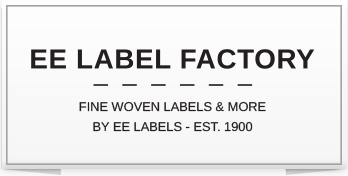 Good value for money plus guaranteed delivery time of 7 working days makes the choice to work with EE Label Factory an easy one. Depending on your requirements, we also offer the right variations to make the label that's just right for you. To give you an example, placing a dark-coloured text or logo on a light-coloured background fits our 'Edelweiss' option best. We will use an extra bobbin to make your logo stand out perfectly!